Over on the Reddit college basketball page (please come join us as there are only two active UP posters - https://www.reddit.com/r/CollegeBasketball/) they are doing a big project to write a little encyclopedia page for each of the 352 (?) D1 schools. I volunteered to write the page for UP, but I need a little help from you all. In your opinion, what are the greatest UP rivals, games, plays, players, coaches, and teams? For rivals: Portland State (that's all). It's the only real rivalry that's balanced. Gonzaga is a big game, but not a rival. I am going to mention that we maintain rivalries in soccer with Santa Clara and XC with BYU. For games: I have UP beating BYU in triple OT, our most recent victory over Gonzaga, beating UCLA and Minnesota in 2009. I want to include information on the 1996 WCC tournament, but can't find anything to say other than "we won." Plays: ???? Maybe Kramer Knutson's putback dunk against Saint Mary's that was SC top 10? Bobby Sharp against BYU? Jared Stohl hitting 10 3-pointers against Idaho? For players: I am thinking Pooh, Cook, Slaughter, and Spoelstra (just because he is a coach now). Any stories anyone wants to share about those four? Any important people I am missing (Stohl? Raivios? Sikma?)? Coaches: Jack Avina? Al Negratti? Rob Chavez? For Teams: 1996 (made the tournament). That's about all I have got. I am hesitant to put one of the teams from 2009-11 just because I don't know which was really objectively the best. Please feel free to add, critique, and tell me like it is. Thanks! EDIT: I have edited this like a million times already. Any interesting tidbits about the school and our basketball history anyone wants to add? I recall something about almost recruiting Elgin Baylor back in the day. EDIT 2: Local dining? It's been a while, but I have got Twilight Room, Cha Cha Cha, and Darcy's. I havent hopped on the Reddit bandwagon but this give me a reason to check it out. Thank you for heading up the project, I am sure it will be a good read. I dont have a ton of history to add since i have only been a fan since Ryan started in 2010. Im sure DD or Geez can better place a better rivalry but Portland State seems like a good starting point. Games- I too love the triple OT win over BYU. It, along with beating Gonzaga were the two best games I have been in the stands for. The other two wins you mentioned were great games as well but Im guessing that the other guys will have some classics from the past. Plays- Always nice to be on the SC Top Ten, in fact Ryan holds the dubious honor of being in the #1 play on SC. Unfortunately it was when he got yoked on by the guard from Kentucky. I dont know enough of past players to sound in, but imho the best since 09 have been TJ, Sikma, Stohl, Ryan (biased), and to add a center Robin Smeulders. Good luck and thanks again! Rivals: Gonzaga is UP's only rival in basketball....regardless of the record disparity. Coach: Most well known throughout the country is obviously Terry Porter, but a guy well-liked by many, and very successful considering his initial resources, is Eric Reveno (currently an assistant at Georgia Tech). Avina, Holton, and Chavez were okay, but were not successful at maintaining UP's rigorous academic standards among their players. Negratti, being from an entirely different era, is difficult to judge as a coach, but with close to zero resources he did a heck of a recruiting job and played some awfully tough teams during his tenure....including UCLA on more than one occasion when the Bruins were at their peak. Games: In addition to the 3-OT win over BYU, the two that stand out most for me are UP's win at GU in 2003, and UP's defeat of SMC on "Nacho Night" in 2009. The Pilots win at GU in 2003 was during Pooh Jeter's and Donald Wilson's freshman year, and it was the first time UP had defeated GU since 1990. More importantly it also broke GU's 21 game home winning streak against WCC opponents. The Nacho Night game in 2009 probably ranks in the Top-5 for most raucous games ever in the Chiles Center. The Gaels were playing without Paddy Mills, but were still ranked 18th in the nation when the Pilots blew them out, 84-66, to move UP's conference record to 6-1. Nick Raivio had 27 that night and Jared Stohl came off the bench and was 6/7 behind the arc. Probably more exciting, but maybe not as memorable is the 2010 game against SMC that went to OT with the Pilots winning 80-75. Matthew Dellavedova was held to something like 4 points in 42 minutes while my favorite Pilot, TJ Campbell had 24. Plays: Probably too many to remember, but the recent ones that standout for me are the clutch last-second shots by Wintering and Stohl. Knutson's put-back is always fun to watch! Players: It's unfortunate that the good measure of a player tends to be exclusive to those who played in the NBA, as there are many very bright, articulated, well-educated UP grads that have gone to play in Europe or have chosen a profession outside of basketball. Just off the top of my head, Sikma (who's team just won the Spanish championship), Jeter, Wilson, Raivio, Nicholas, Campbell, Smeulders, van der Mars, Knutson, and Wintering come to mind. If you want an NBA player you cannot overlook Ray Scott, who played at UP in the late 50's, had an 11 year career as a player in the NBA and ABA, coached the Detroit Pistons for four years, and was the NBA Coach of the Year in 1974. Regarding the 1996 team that went to the NCAA Tournament: Those were exciting times for UP, but the skill level at UP and throughout the WCC was not near what it is today. The '96 team was really a rag-tag bunch, many of whom were recruited by Larry Steele, who coached at UP for seven seasons, but were coached-up by Rob Chavez and his assistants. UP, 19-10, qualified for the NCAA Tournament that year by winning the WCC Tourney at Santa Clara by beating GU and LMU in the semi-final and final, but were then blown-out by Steve Lappas coached Villanova (2nd in the Big East), 92-58. UP was the #14 seed in the Midwest Regional played in Minneapolis. (#10 seed SCU was the at-large team from the WCC that year, and beat #7 Maryland in the first round before losing to #2 Kansas). DD wrote: The Pilots win at GU in 2003 was during Pooh Jeter's and Donald Wilson's freshman year, and it was the first time UP had defeated GU since 1990 1996 in the conference tournament final (76-68. They also beat the Zags 67-66 at home that January). More importantly it also broke GU's 21 game home winning streak against WCC opponents. DD wrote: The Pilots win at GU in 2003 was during Pooh Jeter's and Donald Wilson's freshman year, and it was the first time UP had defeated GU since 1990 1996 in the conference tournament final (76-68. They also beat the Zags 67-66 at home in January). More importantly it also broke GU's 21 game home winning streak against WCC opponents. Thanks, meant to write "in Spokane since 1990," as intimated in my last sentence: "More importantly it also broke GU's 21 game home winning streak against WCC opponents." [quote="DoubleDipper"]Rivals: Gonzaga is not UP's only rival, even if you shout it from the rooftops. Twisting oneself into a knot over the meaning of the word is not a useful exercise. I think that PSU fits nicely, as do many of the schools we continue to play, regardless of our record. Seattle U was our main rival before my time and may return to that status if they again become a part of the WCC. Avina was a hell of a coach and worked, like Negrati is alleged to have done, with little to no resources. Lest we forget, Jack lasted in the seat for 17 years, without funding, a stretch no successor has achieved. Jack was the coach of the Pilots for a number of years before the Chiles Center was built: his success may have had a little to do with it. His success also contributed to our joining the conference we are in, but for which we would have struggled to remain D1. Games: The game with OSU at Memorial Coliseum when OSU was rated 6th was one hell of a game. Thank you Jack Avina. The Beavers were coached by the legendary Ralph Miller and included Steve Johnson, Charlie Sitton, and I believe Ray Blume. Players: Any list of players needs to include Darwin Cook--ten years in the NBA and perhaps the best point who ever graced the Pilot uniform--and Jose Slaughter, drafted in the second round by the Indiana Pacers and then papa Rick Ravio. All three were on the court when the then unrated Pilots defeated the Beavers at the Coliseum. Tough to see PSU as a rival when they didn't play basketball between 1980-81 (NAIA) and 1995-96. The first time we played them as a D1 team was 1996-1997. We didn't play them again until 1999-2000. We have played them fewer than 20 times as a D1 team. **President** - Rev. Mark L. Poorman, C.S.C. * 2014 - [Portland](#f/portland) 114-110 (3OT) [BYU](#f/BYU) – The Pilots, led by the eight 3-pointers of Bobby Sharp, [outlasted the BYU Cougars in the Chiles Center after 3 overtime periods of play]( http://portlandpilots.com/news/2014/1/24/MBB_0124143455.aspx?path=mbball). This is a game that even BYU fans admit is one of the greatest games they have watched. 2014 - [Portland](#f/portland) 82-73 #18 [Gonzaga](#f/gonzaga) – This was Pilots most recent win against WCC powerhouse Gonzaga. [Portland led the game start-to-finish](http://portlandpilots.com/news/2014/1/10/MBB_0110142907.aspx?path=mbball) in former head coach Eric Reveno’s only win against the Bulldogs. 2009 – 76 Classic Tournament - [Portland](#f/portland) 74-47 [UCLA](#f/ucla) and [Portland](#f/Portland) 61-56 #16 [Minnesota](#f/Minnesota) – In a shocking start to their 2009-2010 season, the Pilots [routed traditional power UCLA]( http://portlandpilots.com/news/2009/11/27/MBB_1127092026.aspx?path=mbball) and then followed that victory up by [upsetting the #18 Golden Gophers of Minnesota]( http://portlandpilots.com/news/2009/11/27/MBB_1127092352.aspx?path=mbball) in the 76 Classic Tournament. Despite losing to West Virginia in the tournament finale, the Pilots earned their most recent national ranking by entering the national polls for one week at #25. 2003 - [Portland](#f/portland) 72-68 [Gonzaga](#f/gonzaga) – The Pilots defeated Gonzaga for the first time since the 1996 WCC Tournament and did so on Gonzaga’s home floor, which snapped the Bulldog’s 21-game home winning streak against WCC foes. This was the Pilots first win against Gonzaga in Spokane since the 1990 season. 1996 - [Portland](#f/portland) 76-68 [Gonzaga](#f/gonzaga) – [The Pilots only WCC championship]( https://www.youtube.com/watch?v=Jn9vEbqvY00). This victory gave the Pilots their most recent berth in the NCAA Tournament. 2014 – Bobby Sharp hits [8 3-pointers]( https://www.youtube.com/watch?v=DSe6JvxeAb8) to lead a triple overtime victory over BYU. 2011 - Kramer Knutson [putsback a missed bucket]( https://www.youtube.com/watch?v=tN5bbbCk-s4) by Nemanja Mitrovic for a dunk against Saint Mary’s that landed at #5 in SportsCenter’s Top 10. 2009 – Jared Stohl, who led the national in 3-point shooting percentage, [drops 10 3’s]( https://www.youtube.com/watch?v=KfxrIgTb_UY) for a school record against Idaho. Jose Slaughter – The Pilots all-time leading point scorer (1940): Slaughter played for Portland from 1979 to 1982. Slaughter was later drafted and played for the Indiana Pacers. Eugene “Pooh” Jeter – The Pilots second all-time leading point scorer (1708): Jeter played for the Pilots from 2003 to 2006. A member of the Ukrainian National Basketball Team, Jeter is the Pilots most recent NBA player after having played the 2010-2011 season for the Sacramento Kings. Darwin Cook – Coming in at 3rd in the Pilots all-time scoring list with 1678, Cook is also the Pilots all-time leader in assists and steals. Cook played from 1977 to 1980. Cook played in the NBA for the New Jersey Nets, Washington Bullets, San Antonio Spurs, and Denver Nuggets. Ray Scott – A Pilot for only a short time (1957-1958), Scott was drafted with the 4th overall pick in the 1961 NBA draft by the Detroit Pistons. Scott enjoyed am 11-year career as a player in the NBA and ABA and coached the Detroit Pistons from 1972-1976. In 1974, Scott was named NBA Coach of the Year. Erik Spoelstra – A WCC Freshmen of the Year award winner, Spoelstra played for the Pilots from 1989 to 1992. Spoelstra is better known now as the head coach of the NBA’s Miami Heat and led the Heat to two NBA Championships in 2012 and 2013, while winning a third NBA championship as an assistant coach in 2008. Honorable Mention: TJ Campbell, Kramer Knutson (now an assistant coach with the team), Ryan Nicholas, Rick Raivio, Nik Raivio, Luke Sikma, Robin Smeulders, Jared Stohl, Thomas van der Mars, Donald Wilson, and Alec Wintering. Jack Avina – the longest tenured Portland coach at 17 seasons(1970-87). Avina finished his career at a 222-243 record. Al Negratti – served as the Pilots head coach for 12 seasons (1955-67) and led the team to several NAIA tournament appearances as well as one NCAA tournament appearance in 1959. Negratti finished his career with an all-time record of 164-155. Rob Chavez – the most recent coach to take the Pilots to the NCAA tournament, Chavez led the program from 1994 to 2001. Chavez finished his career with a 93-103 record. 1995-96: the most recent Pilots team to make the NCAA Tournament finished with a 19-11 (7-7) record and won the WCC Tournament Title. While more of a soccer tradition, the [Villa Drum Squad]( https://secure.static.tumblr.com/6befb434edbc59d6d629eb6c129ae3fe/dkdldcg/362myjbl4/tumblr_static_1167607_10151552308786408_887447943_o.jpg) are the traditional heart of Pilot spirit on campus. The men who live in Villa Maria Hall don kilts and drums at soccer games, lead the cheers of the student section, and are known for the [tifo displays]( http://www.espn.com/photo/2013/1105/espnw_e_merlowfield_gb1_800.jpg) and loyalty to Pilot athletics. Their spirit sometimes translates over to the Chiles Center for basketball games. Locals like to eat at the Twilight Room, Cha Cha Cha!, and Darcy’s. Portland is not a basketball school, but has been successful in other sports. The Pilots have won two national championships (2002 and 2005) in women’s soccer and previously won 32 straight WCC men’s cross country championships from 1979 to 2010. Portland has sent numerous alumni to the US men’s and women’s national soccer teams who have won FIFA World Cups and Olympic Gold Medals. As the crow flies, Portland is the closet university to both the Nike Global headquarters and the Adidas North American headquarters in Portland. The past few years have been far from desirable for Portland. After former head coach Eric Reveno lead the team to it’s best three seasons in a row from 2009-11, the results began to disappoint and Reveno was fired in 2016. New head coach Terry Porter raced out to a surprising 9-5 start to the 2016-17 season, but the Pilots face-planted the remainder of the season to finish 11-22. Coach Porter made it known that he believed the current players were not D1 quality and many left the program. However, an exciting 2017 recruiting class will see many new players which has the Pilot faithful optimistic for the future. Geezaldinho wrote: Tough to see PSU as a rival when they didn't play basketball between 1980-81 (NAIA) and 1995-96. The first time we played them as a D1 team was 1996-1997. Stretch your imagination. They are close geographically. We play them frequently. By that standard the big NW rivalries would be Seattle-UW and Gonzaga -Eastern Washington. Good rundown, SCP....I certainly think it meets the requirements of Reddit. 1. I personally have never considered PSU to be a "rival" in the true sense as the two schools are so dissimilar except for their similar zip codes. PSU is a state school, a much larger school, and is generally considered a commuter school with a number of non-traditional students. Academically their football and basketball teams have been called "train wrecks" more than once, which, in part, took them away from D1 basketball for a number of years, and until the 2018 or 2019 season they have played their games in a substandard "gym." IMO, a "rival" has got to be a school UP compete with at all levels in both scholastics and sports, and that includes recruiting for scholars and athletes. Yes, GU has won the athletic side in recent years, but that hasn't stopped the rivalry. As crappy as Seattle U's athletic department and facilities have been in recent years, if UP were to again start playing two a year against them, that would be a natural Seattle vs. Portland rivalry that might not match the Timbers and Sounders, but it could be a lot of fun. 2. Now that the Pilot House is "wet" after 4pm everyday, its beer and burgers and others delicious dishes have made it more popular with students, alums and fans than the T-Room or most other North Portland establishments....that is according to a recent, but unscientific poll taken by a UP student. 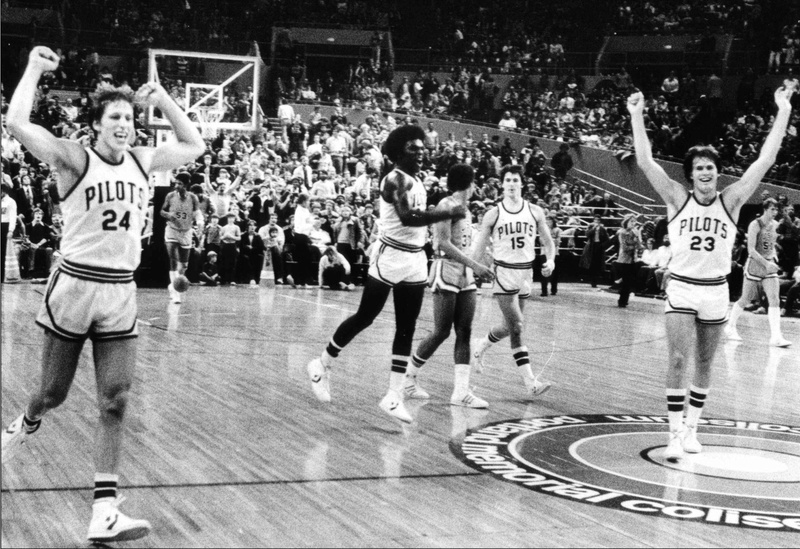 Also, this classic pic was taken after a win over OSU in 1979 at the Far West Classic in the Memorial Coliseum. That OSU team also was ranked at the time and went on to win the Pac10 and was ranked as high as #2 in the country later in the season. They also finished with a #2 seed in the tournament. Another big win from that era came in 1978, when the Pilots beat a ranked San Francisco team in Howard Hall. That USF team was ranked as high as #5 that season and made the Sweet 16. Oh! And you can't forget about Yasutaka Okayama! 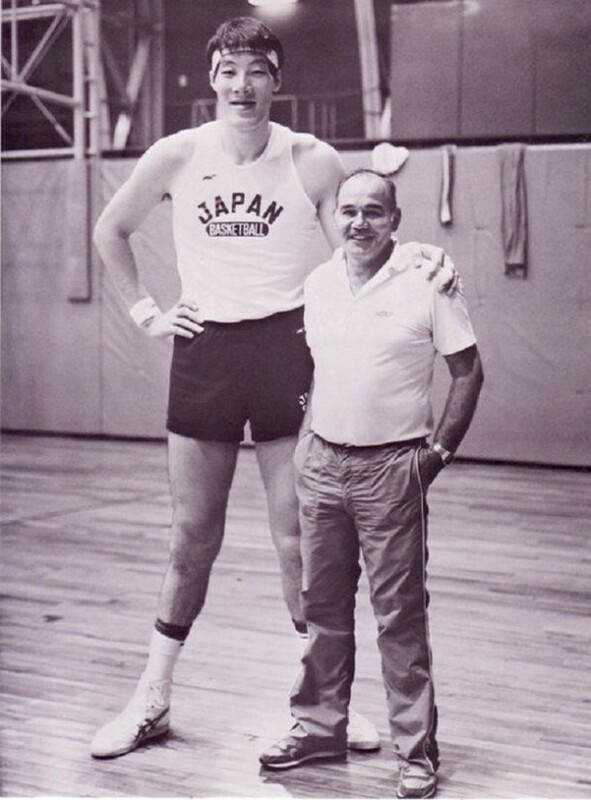 He still holds the record for being the tallest player ever selected in the NBA draft at 7'8". Regarding plays--Casey Flicker's shot to beat USF at the buzzer, following Dionne Holton bringing the ball up and passing to him was pretty memorable. Students rushed the court after that one. I think the information assembled is pretty good, but has too much emphasis an very recent teams and players. The Honorable Mention group needs some rethinking. Rick Raivio was a very solid player on very solid teams with Jose Slaughter and Darwin Cook. Their wins over the highly ranked USF Dons in 1978 (101-87) and the Oregon State Beavers in 1979 (94-86) were a couple of the all time wins. Both games were at Memorial Coliseum, not Howard Hall as erroneously reported on a basketball history site. Vas you dere, Charlie? Yes I was...for both. Don't forget Cincy Powell (1962-1965), an eight year ABA veteran, with a couple All-Star games. Also, Jim Winters (1949-1952 and 1955-56), who interrupted his career to serve in the Army and still made Honorable Mention All American in his final year at UP. Lastly, Christine Sinclair needs something more than "Canadian Soccer Player", even though it's a basketball article. Keep up the good work, but find some old farts to quiz. OldePilot wrote: I think the information assembled is pretty good, but has too much emphasis an very recent teams and players. The Honorable Mention group needs some rethinking. Rick Raivio was a very solid player on very solid teams with Jose Slaughter and Darwin Cook. Their wins over the highly ranked USF Dons in 1978 (101-87) and the Oregon State Beavers in 1979 (94-86) were a couple of the all time wins. Both games were at Memorial Coliseum, not Howard Hall as erroneously reported on a basketball history site. Vas you dere, Charlie? Yes I was...for both. Yup. I remember both games mentioned, and was looking for them to share, but the sites I found listed Howard Hall, and I knew I watched them in the Coliseum. The USF win was highlighted with an awesome dunk by Darwin Cook over Bill Cartwright. The OSU win had long-time Pilot faithful giddy in the post-game celebration. Must be something missing from the UP career records. Alec W. is shown as the all-time leader in FTs made with 499. But there are 24 guys from the '40s and '50s with anywhere from 1269 to 3098 FT attempts, with only one listed on the FTs made list. What, were FTs from half court in those days? If the numbers are to be beloeved, Leo Grosjaques with 3098 attempts made less than 8% to not show up on the top 25 for FTs made. Another notable Pilot you could mention is Frank Bosone. From the NWACSports.org web site. After graduation, he accepted a basketball and track scholarship to the University of Portland. As three-year starter for the Pilots basketball team, Bosone was named a Catholic Digest All-American in 1961 and All West-Coast Honorable Mentions in 1960 and 1961. Bosone also held sprint and relay track records at Portland, which went unbroken for 18 years. After graduation from Portland, Bosone became a basketball referee. During his 35 year career, he officiated over 1,400 division I games, 19 NCAA tournaments and the National Final in 1990.
up7587 wrote: Must be something missing from the UP career records. Alec W. is shown as the all-time leader in FTs made with 499. But there are 24 guys from the '40s and '50s with anywhere from 1269 to 3098 FT attempts, with only one listed on the FTs made list. What, were FTs from half court in those days? If the numbers are to be believed, Leo Grosjaques with 3098 attempts made less than 8% to not show up on the top 25 for FTs made. Something is definitely off with those numbers... both the FT attempts and the FG attempts. Just look at how many players from that era have an even 3000 FG attempts. Lots of even 2000s too. Doing a bit of sleuthing, assuming his points total (1123) and made FG (440) numbers are correct, that would put his total number of FTs made at 243. (No 3 pointers back then.) So he probably attempted something like 350 or so if he was a 70% FT shooter. Also, I just watched this Howard Hall farewell video... can any of you remember the win over Santa Clara that is referred to at 1:26? I can't find a UP win over SCU during that time... best I can see is a one point home loss the season after SCU was ranked #2. Since we now know those sites can be wrong about the location of games, maybe they got a score wrong too? And we beat them in 1977 also, but it was in the Leavey center. We also beat them in 1973(88-84), also in the Leavey center. We were Indipendent, Santa Clara was in the WCAC in the early years. We didn't play them often. OK...anybody remember games at the P.I.? Or when we played Oklahoma City, coached by Abe Lemons, at Hudson's Bay High School in Vancouver? I remember going to the Expo Center to watch a broadcast of an away game. I'd guess at Seattle U. That had to be early '60s. I'm reasonably sure that every UP Alum that posts on PN considered Howard Hall to be quite "ancient" when they first entered it as a student, but now that 2017 Reunion Weekend is over, the demolition of Howard Hall can begin....just 90 years after its dedication. The classroom building that will occupy Howard Hall's space is expected to be ready for occupancy in time for the second semester, 2019. This does, however, prompt a larger discussion perhaps. Who is our rival? I essentially chose to leave Portland State as our listed rival and left a note regarding the author's choice on the subject. To respond to DD's comments about Portland State being so dissimilar to UP I would say this: Xavier and Cincinnati are demographically DISsimilar and hate each others' guts. That being said, the level of basketball in that rivalry is better than ours. Still Gonzaga is a good rival, but I just don't know that they acknowledge us as such. There is at least a mutual understanding between us and Portland State that we don't want to lose or fall behind them. "PSU is a state school, a much larger school, and is generally considered a commuter school with a number of non-traditional students. Academically their football and basketball teams have been called "train wrecks" more than once . . ."
I point out that the suggestion that PSU is a state school and therefore dissimilar from us is, first, an attempt to redefine the word rival, to, if you will, add conditions that are not generally considered to be within the definition. And, Duke and UNC are private and state schools respectively and accordingly arguably dissimilar, who most certainly are rivals in basketball. "A person or thing competing with another for the same objective or for superiority in the same field of activity," is an appropriate definition of rival and it loops in PSU just fine--lest we forget, PSU beat us on our home court this past season. If you want to define rival as someone or an institution with whom you "compete for superiority with; be or seem to be equal or comparable to," that sure would not include Gonzaga basketball wise--perhaps outside of sports. Ultimately sentiment runs in favor of Gonzaga as our "rival," but it is hardly the case over PSU. And, I do not think it matters as to whether PSU is currently a rival that they dropped basketball for a period of time--those days are gone. So your choice of PSU is just fine.